I had a couple of appointments planned this week, but what's a couple of appointments in a whole week, right? So Monday started off great with me working on some Goal 2 and Goal 4 and some Goal 7, which involved getting ready for Writers' Group Monday night and then, indeed, going to Writers' Group Monday evening. And then this happened on my way home. I was on a multi-lane highway, in the dark, when my car was hit by something. Then hit again. And again. We think from the looks of the car that I was hit three times. And that what hit me was a rogue tire. Though I didn't actually see the tire, either while the accident was happening or afterward, so it's possible that I was being attacked by a giant, invisible creature that had slipped out of another dimension and had no idea what it was doing. We believe it was a tire, though, because of the tire marks on the side of the car, where no tire marks should ever be. The very young state trooper was quite blown away by the sight of it. Seriously, I was home an hour later, so it's not as if a car accident was all that time consuming. And it was 9 o'clock in the evening when all this first went down. Not my prime work time, anyway. What happened the next day, though, was I had an appointment in the morning, then I go home with plenty of time to work. But I'd been in an automobile accident the night before, right? So while I did write a couple of blog posts, mostly I spent the afternoon watching two episodes of Fixer Upper, because everyone watches that, and an episode of Outlander. I'm with Claire about the second season's Parisian setting. I'm not liking it as much as the first season in Scotland. Though I am able to understand a little bit of the French, which is gratifying. 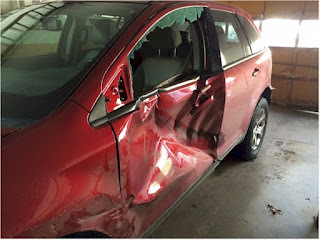 Then on Wednesday I had to go with my husband to pick up a rental car, and then I had to follow him as he drove the damaged car to a shop for repairs. Then one thing led to another, and the only thing I did for work was buy some padded envelopes to mail books in. And then Thursday I was on the road all day, because that's what I do on Thursdays, whether I've been in an accident Monday night or not. So that was almost the whole flipping week. Today is Friday, and I'm back on goal. Hmm. Maybe I'll start using that term here instead of "on task." Yeah, I'm back on goal today, specifically Goal 4. 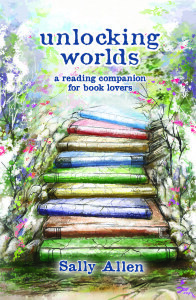 And I won a copy of Unlocking Worlds: A Reading Companion for Book Lovers by Sally Allen through the blog Book Nation by Jen. Which just goes to show that anyone can win a book at a blog giveaway. 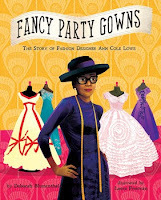 You still have time to sign up for your chance to win Fancy Party Gowns. Go for it. Because it is good to win a book. Especially the week your car has been hit by a flying tire. And you never know when that's going to happen.